“An extra round of applause for JoAnna Ford whose sweet voice and self-effacing demeanor brought the spunky Treemonisha to life.” Terry Ponick, Washington Times Community. JoAnna Marie Ford shines as a true crossover singer. This Baltimore native’s accolades stretch from realm of classical to pop, rounding up applause in musical theater, jazz, hip-hop, and R&B along the way. In 2016, JoAnna joined the cast of Norwegian Cruise Lines production of Tony award winning Broadway show After Midnight. During this contract, she worked with the original Broadway production team headed by awarding winning choreographer and director Warren Carlyle. Hired for the role of soprano trio member and female swing, JoAnna performed all but one of her cover roles in the show. With Norwegian, she also sang in two contracted cabarets, and even created and performed her own cabaret “Lady Loves Songs: A Tribute to the Pop Divas.” Her creative persistence and ability to work well with others while with Norwegian, earned several contracts in the Westcoast Black Theater Troupe’s 2017, working with Westcoast’s founder and creative director Nate Jacobs (Norwegian cabaret director). JoAnna is grateful for all her new opportunities, and credits her success to the skills she learned as a classical singer. As a classically trained soprano, JoAnna has poured charisma and grace into the roles of Mozart’s Despina and Pamina, Monteverdi’s Drusilla and Amore, Gluck’s Euridice, Scott Joplin’s Treemonisha, and Menotti’s Lucy. In 2015, JoAnna breathed life into the role of Cleota from H.L. Freeman’s forgotten opera Voodoo. The New York Times raving reviews and the sold out audiences testify to the passion with which JoAnna and her Harlem Opera Theater colleagues revitalized this work which had not been performed since 1928! Though operatic roles prove her vocal competence, JoAnna’s concert and recital work attest to her artistry in the field of classical music. As a concert artist, JoAnna boasts of performing oratorio, anthems, spirituals, and operatic selections, with several orchestras. In 2015, JoAnna made her debut with the Baltimore Symphony Orchestra, under the baton of Maestro Ken Lam, performing spirituals, and selections from Scott Joplin’s Treemonisha. She has performed selections from Die Zauberfloete under conductor Julien Benichou and the Mid-Atlantic Orchestra. In addition to these highlights, JoAnna has had the pleasure of interpreting soprano solos of Handel’s Messiah, Rutter’s Gloria, Haydyn’s Paukenmesse, J.S. Bach’s Magnificat, Mozart’s Solemn Vespers as a hired church soloist. Outside of concert work, JoAnna LOVES to perform recitals! The most innovated was her 2015 Art/Sound/Now recital at the Walter’s Art Gallery in Baltimore, Maryland. For this project, JoAnna worked with the museum curator to create a moving recital in which the musical sets reflected the physical art. For each set, the pianist & keyboard, curator, and JoAnna, literally moved to a new collection for the purpose of “singing the art to life”! Such flexibility defines JoAnna’s musical journey. This same flexibility empowers JoAnna to authentically interpret other musical styles outside of the traditional realm of classical music. JoAnna’s eclectic musical interests and keen ability to interpret other musical genres, allows her the freedom to authentically perform an array of musical styles. JoAnna currently works for Westcoast Black Theatre Troupe’s 2017 season, performing in 3 brand new musical review shows. As a Fulbright Scholar in Berlin, Germany JoAnna recorded and performed for an independent gospel label (Jazz for Jesus) in addition to performing with the Weimar Lyric Opera Studio. Her hip-hop, rock, soul album “Truth To Power” with the group Intifida received favorable reviews from the old Tower Records. In her short time of living in New York City, JoAnna has won a position as a touring singer and dancer with the New York Metropolitan USO Show Troupe. She also sings frequently in the jazz and R&B open mics in New York. 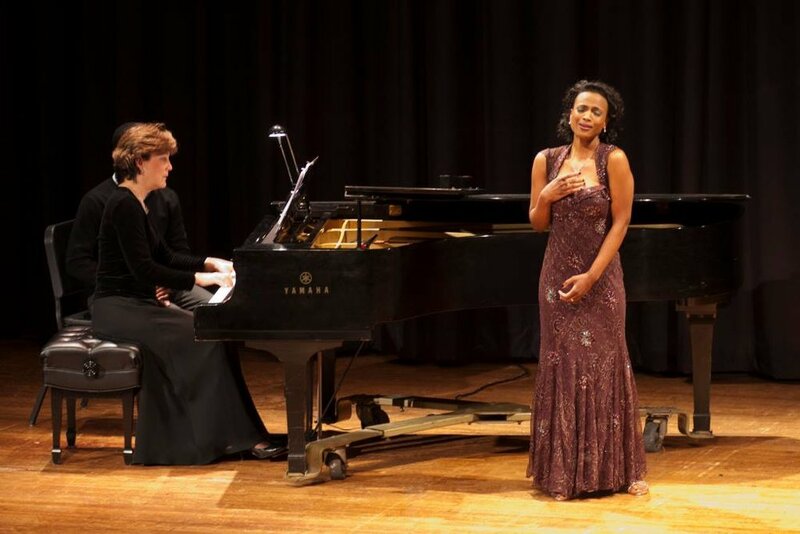 JoAnna holds a MM in Vocal Performance from the University of Michigan School of Music Theater and Dance, and a BA in Music from Morgan State University. She is grateful for the gifts with which the Almighty has blessed her. She is also particularly grateful for family, mentors, teachers, music programs, church ministries, and sponsors who have given her the opportunity to develop her unique talents.